Happy Holidays friends! I’m so excited to be here today, and truly honored that Jen has asked me to share a Holiday idea with you. I’m Rebecca, and you can find me over at The Crafted Sparrow, a DIY/craft blog dedicated to all the things I love and create. 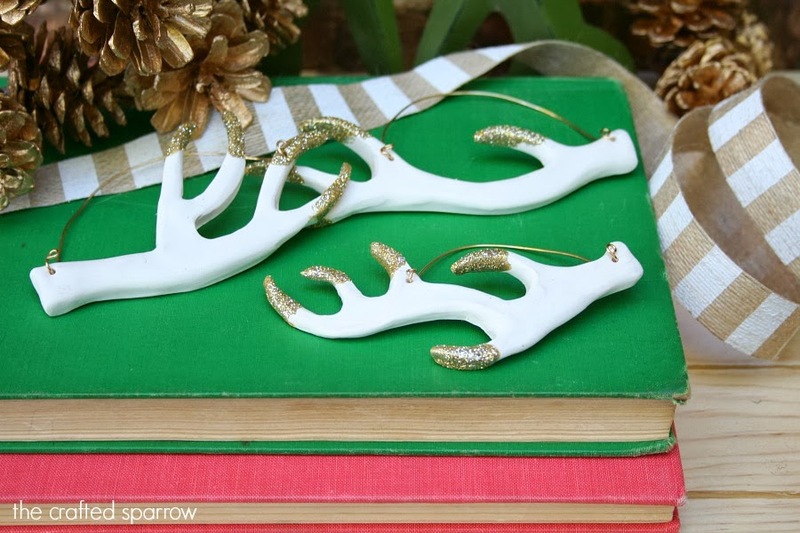 Today I’m sharing these super fun DIY Antler Ornaments that I made for my tree this year. Every year for Christmas I pick a new theme to my tree, I keep basic ornaments from year to year that will work with most themes and build my tree with lots of other fun ornaments and things. I love to include a few handmade ornaments each year that I create to match the theme. Since antlers are so popular this year I though it was a great way to incorporate them in to my tree this year. 1. Roll a handful of clay in to a ball about 2.5″ in diameter and place on your cutting mat or surface. 2. Roll out your clay using a rolling pin or smooth acrylic rolling pin made for clay, you can also use a full soda can if you don’t have a very smooth rolling pin. 3. Using your Xacto knife cut out an antler shape, you can print a template from online if you need to. Most antlers face upwards so remember that when creating yours. No two sets of antlers are ever the same, so it’s fun to create them all different. 4. Once your shape is cut out you will need to smooth all the edges with your fingers. Once your happy with the way it looks use a small toothpick or paperclip to create your holes for the wire. 5. Using a metal spatula place your antlers on to a piece of parchment paper, you can adjust any mistakes if something gets flawed when you move it. Bake in an oven according to your clay package instructions, I typically bake it at 250* for about 10-15 minutes watching it closely so it doesn’t burn and turn brown. 6. 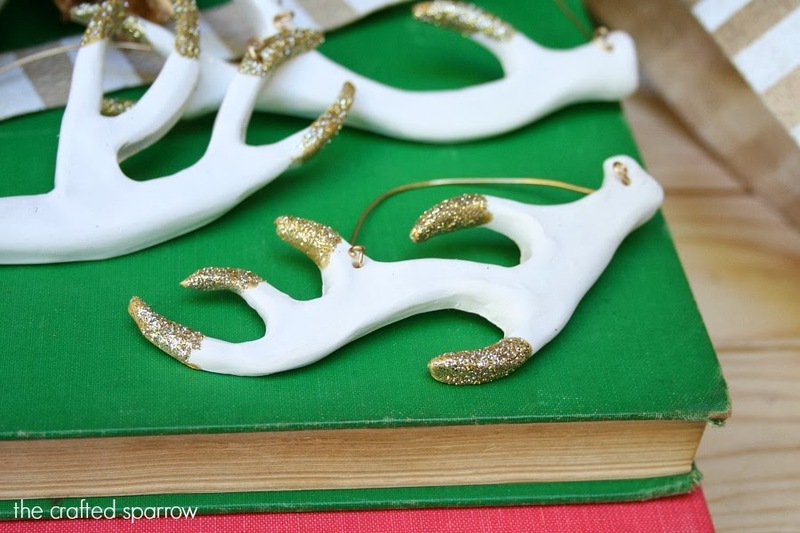 Once cooled from the oven, use your gold glitter to glitter the tips of the antlers. 7. Use your gold wire and some small needle nosed pliers to create the hangers for your ornaments, simply just coil your ends to stay put. I seriously love how these turned out and I think I will definitely be making more to add to my tree this week. These would be a great gift for someone who is loving the antler trend right now too. I don’t have my full tree up quite yet, but I thought I’d give you an idea of what they will look like on your tree. Mixed with beautiful rustic elements like pine cones and burlap these ornaments will be a beautiful addition to your tree. Rebecca’s The Crafted Sparrow is one of my new favorite blogs. I love her ideas and she has an amazing sense of color! This an awesome organizing idea, and it would make a great DIY gift idea for someone! As you think about decorating your tree this year, you might consider making Rebecca’s super cute felt ribbon candy! You could make it in colors that complement your holiday decor! I love creating things from felt, and this easy-sew felt advent banner is the perfect way to count down to Christmas with your kids! Jenn these are so unique, like nothing I’ve seen out there. I love them, the glitter is perfect too! These are a great idea! I collect and decorate with reindeer, so these would fit in beautifully! What a fun and creative idea Rebecca! Way cute, Becca!! Turned out fab! LOVE these ornaments! So chic!! I love these little clay antlers! Love the felt projects too! So clever and great ideas for gearing up for the holidays!! So creative! Love this idea!! These are AWESOME!!!!!!!! I MIGHT HAFTA TRY THIS ONE! Wow! I love these! Thanks for sharing! These turned out lovely! Thanks for sharing. I have some white clay on hand and may just give these a try. These turned out sooo cute Rebecca. Love what you did! Oh what a clever idea!! Turned out fantastic!